From Robert Kirkman, the creator of The Walking Dead, comes a new horror series that is as disturbing as it is scary. 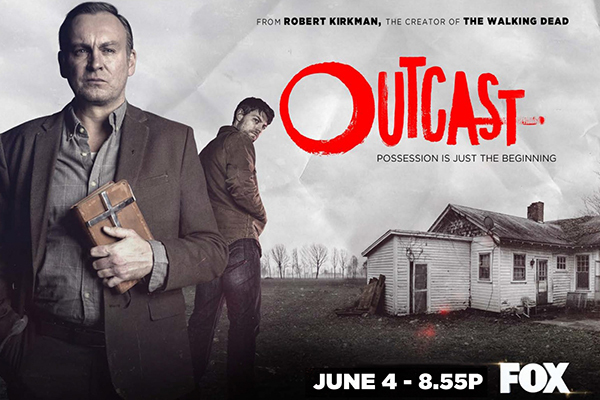 Outcast, based on the Skybound/Image comic title by Kirkman and artist Paul Azaceta, follows Kyle Barnes, a young man who has been plagued by demonic possession all his life. Now, with the help of the Reverend Anderson, a preacher with personal demons of his own, Kyle embarks on a journey to find answers and regain the normal life he lost. But what Kyle discovers could change his fate — and the fate of the world — forever. The pilot was directed by Adam Wingard. It will premiere June 4th on FOX.